Show kids a playground — any playground — and they’ll be pretty happy. But nestled amongst the hundreds of slides and swings across the Pittsburgh region are a few playgrounds that bring something special. Whether it’s a million-dollar art installation or a cardboard-fueled concrete slide, these (free!) playgrounds are worth a detour, if not their own road trip. Artist Tom Otterness with his sculpture “Playground” at the Aspinwall Riverfront Park. It’s bring your own cardboard at Blue Slide Park, located at one of the entrances to Frick Park in Squirrel Hill. The multi-level playground is large in its own right but it’s the blue concrete slide, carved into a hillside, that provides the biggest draw — for toddlers who need to be carried up the steep ascent or daredevil tweens surfing down the slide standing up. 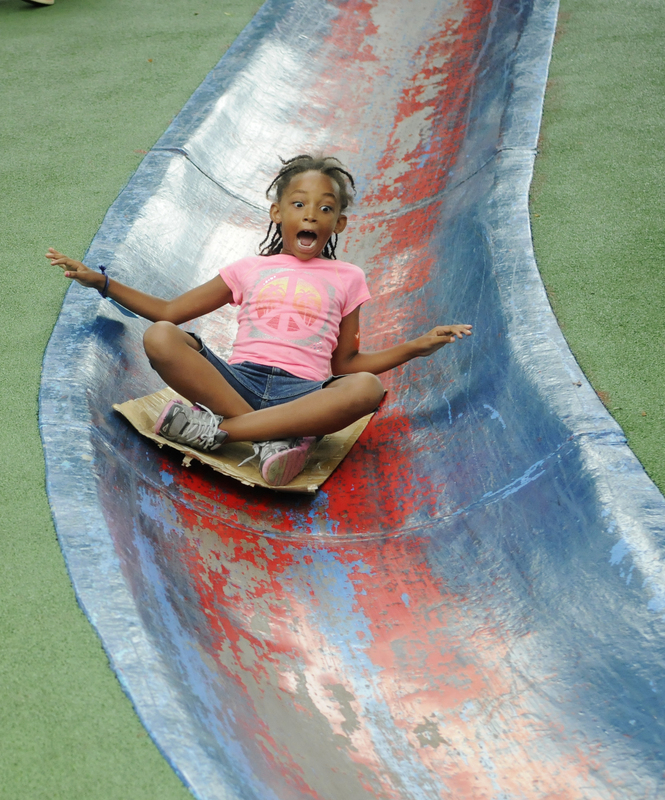 Pieces of cardboard are used to make the concrete slide faster and smoother. The playground is also the namesake of a chart-topping rap album — 2011’s “Blue Slide Park” by Squirrel Hill native Mac Miller. Drive onto a bumpy gravel road beneath an unmarked railroad trestle in Aspinwall and you’ll find one of the region’s newest playgrounds — a $1 million-plus art installation by New York sculptor Tom Otterness. The sculpture was purchased by the Grable Foundation and is on permanent loan to the park, which officially opened in September after years of community fundraising. The playground sculpture is dotted with whimsical tiny figures, some evident to onlookers and some visible only to those climbing inside. Only one child at a time can climb into the sculpture’s head, requiring the children to interact with each other and form their own line during busy playtimes. In 2012, former Pittsburgh Pirate and Upper St. Clair native Sean Casey partnered with Pirates Charities to build a Miracle League Field — a soft-surface field that allows children with special needs to play baseball. This spring, an adjacent playground was built to accompany it. The playground — modeled to resemble the skyline view from PNC Park — is any baseball fan’s dream, with slides going through a giant baseball glove and a baseball bat balance beam. In the spirit of the adjoining field, on which children can play, several ramps make the playground accessible. The curators of the 2013 Carnegie International wanted to make play a central theme of the quadrennial art exhibition. And what better way to showcase that by installing a colorful, looping playground outside the Oakland museum. It is the first U.S. installation of a Lozziwurm, something that was popular in Europe in the 1970s. The gated playground appeals to children of all ages — young children can safely climb inside the tunnels and holes while older children can scale the top of the structure. The playground is free but open only during museum hours. When Cranberry decided to replace its decades-old wooden playground, the township went big. The Kids Castle Playground, which opened in 2013, is more than twice the size of the old one, with three sprawling theme areas: Cranberry Yesterday, which uses bricks taken from a former one-room schoolhouse in the township and from the old wooden playground; Cranberry Today, designed with input from current schoolchildren; and Cranberry Tomorrow, with futuristic equipment such as a climbable mobius.